The fact is that almost everything I’ve watched in the last week, I’ve already written about, and the rest is under embargo. So let me broach a subject that I’ve found myself thinking about a lot lately, because it’s become a fact of my day-to-day life. My wife and I, we have two kids—a 4-year-old boy who is basically a small, obnoxious clone of me, with long and often unkempt brownish hair, and a little blond 2-year-old girl who is basically a clone of my wife and who likes to cradle her foot and pretend that it is her baby. I have caught her placing her foot in the basket where we keep their bath toys (it looks kind of like a cradle) and pretending that her other foot is its annoying brother. She is an eerie social mimic—“the actor,” we joke. He is a cosmos of brain-consuming obsession, which include, but are not limited to: trains, insects, the color red, the planets of the solar system, the organs of the human body, the Beatles, and Minecraft. And he is moody, like a bite-sized teenager who has to get up on a step stool to slam the door to his room. Four years old is the worst age, in my experience. Arrival, as reviewed by Savva Vishnevetsky, age 4. I love babies and small kids in general, even the exhausting and super-annoying stuff that makes up the bulk of parenthood. 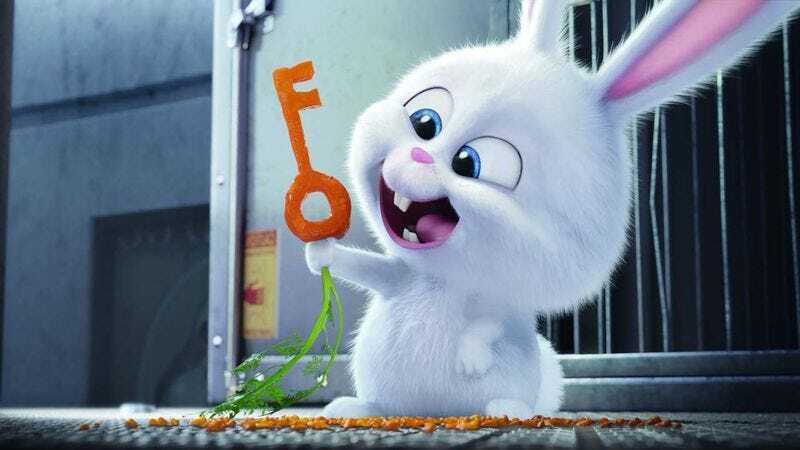 I have seen The Secret Life Of Pets (which my daughter believes is called Puppy) more times than is medically acceptable in the last couple of months, because the one thing my kids agree on is that we should have a dog. And I’ve seen a lot worse—cheap and formulaic direct-to-streaming titles that hold small children at rapt attention through repetition, playing right to a kid’s dislike of variety. Sometimes, they’ll watch more grown-up movies with us at home, the kind we know won’t scare them; Arrival was well-liked for some reason, even though a later, aborted attempt to watch E.T. : The Extra-Terrestrial resulted in screams and sobs of terror. (My son was unwavering in his belief that “the alien will eat the boy.”) But even the bad, lowest-common-denominator-of-childhood stuff I’ve come to appreciate. A lot of kids’ movies are garbage, but watching your kids watch kids’ movies makes up for it. Their reactions are easy to pick apart. I think, for instance, of the way my son sat through Finding Dory (since seen a gazillion times) unable to tear himself away even as he kept wiping away tears from his eyes—a preschooler’s pure self-identification with a little fish who can’t remember, coming right at the age when kids have to learn to follow directions. You realize how much their sense of the world is limited to you and their siblings, if they have any. The first time my son had an overwhelming emotional reaction to a film, it was when he saw a bit of Stephen Chow’s Journey To The West: Conquering The Demons on the TV at our local video store. It was the scene involving the fish-monster and the baby in peril—played mostly for laughs, but he completely lost it, begging to turn the movie off. Every baby is his sister, all parents are his parents, and all small and lost creatures are him, especially if they are asked to do something. Pete’s Dragon, with the boy lost first in the woods and then in the town, was the first live-action film that he got completely invested in. His sister is still at that age when movies are sources of fascination (read: things with fur or feathers) and surprise, rather that stories. But she’s getting there. I don’t want to over-romanticize childhood—it’s a dangerous thing to do, especially for parents. Kids can be vindictive in ways that the decent adults they’ll grow into would never allow themselves to be. I can’t help but think of that pure, undigested response (i.e., “I am the little animal”) as being connected to selfishness. At what point do we stop being emotionally involved in stories only because we see ourselves perfectly projected in them?